If I don't have some place to put something the very moment I walk in the front door, I'm going to lose it. The number of hours I've spent searching for my purse, or keys, or sunglasses might very well astound you. It didn't take long for me to figure out I needed an organizer of sorts and I purchased a set of drawers and a coat rack that have served me well through the years. But now that Rob and I are sharing a home it isn't working out quite as well and since our new space can be a bit awkward we're rocking the drawers and coat rack on different walls so things are spread out. 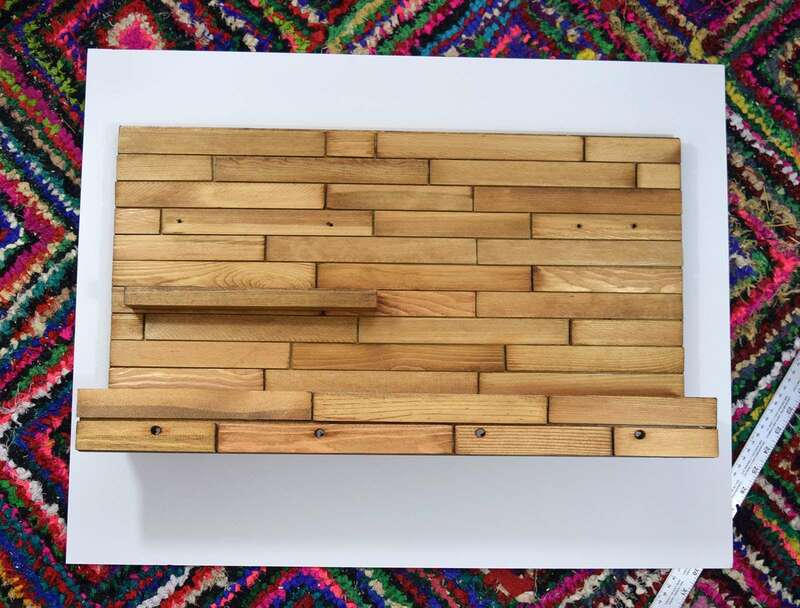 I decided to take ready cut boards from the hardware store to make a new wall organizer that would meet our specific needs. We now have an area just for our mail (which seems to get lost constantly), two sets of keys, a little shelf for our sunglasses and hooks for our jackets, my purse and our dog leashes. In the end, I'm happier with this decorative yet functional bit of wall decor than I ever would have imagined! 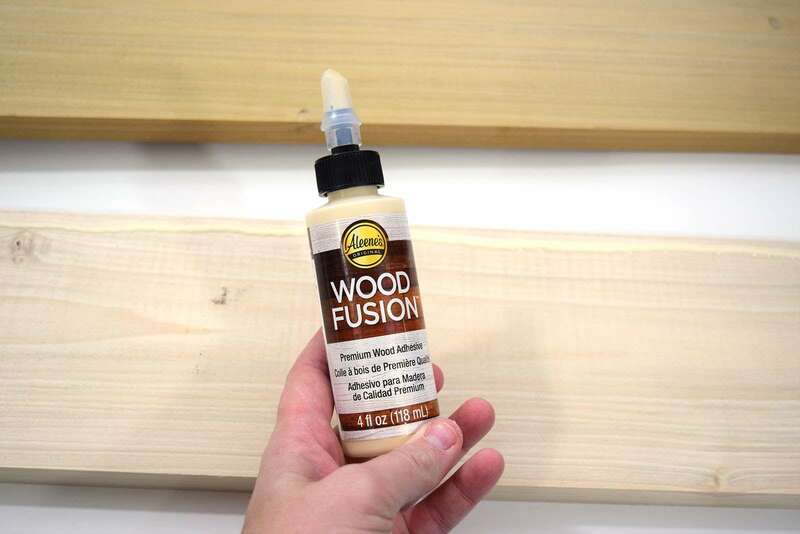 Grab your bottle of Aleene's Wood Fusion and head to the hardware store. 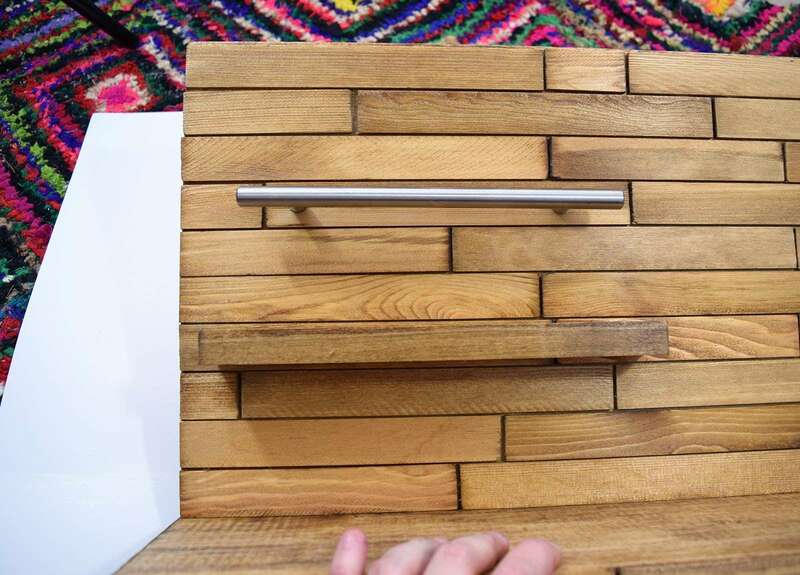 This project uses pre-cut boards, with only a single cut needing to be made at home. 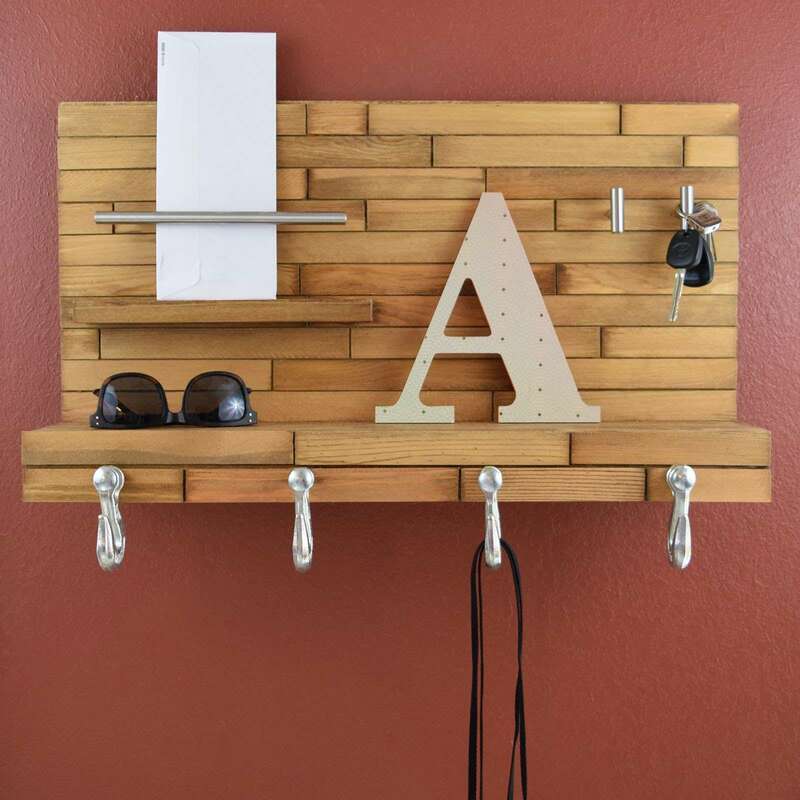 The one cut you will be making uses a hand-held saw meaning you only need a drill to complete this great intro wood working project! 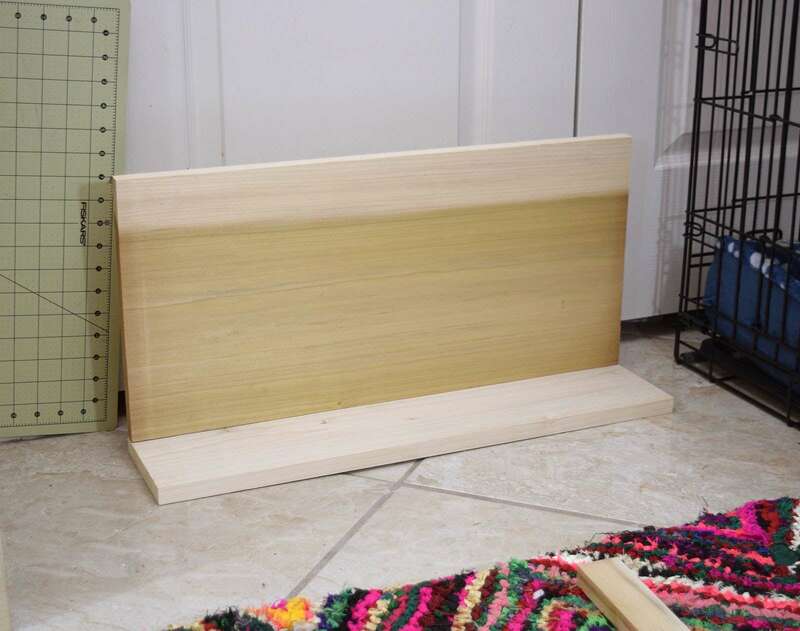 Take your two largest boards (3/4" x 12" x 2' and 3/4" x 6" x 2') and place them together to form a corner like you see above. The larger board will rest on the smaller. 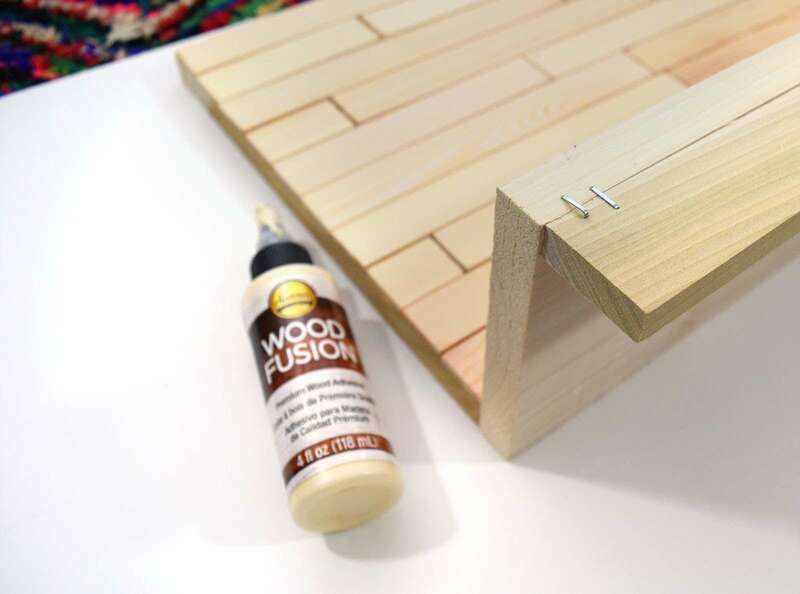 Run a line of Aleene's Wood Glue on the side of the longer board and then place in a safe area where the glue can dry and the pieces can become bonded together. This is best done overnight. 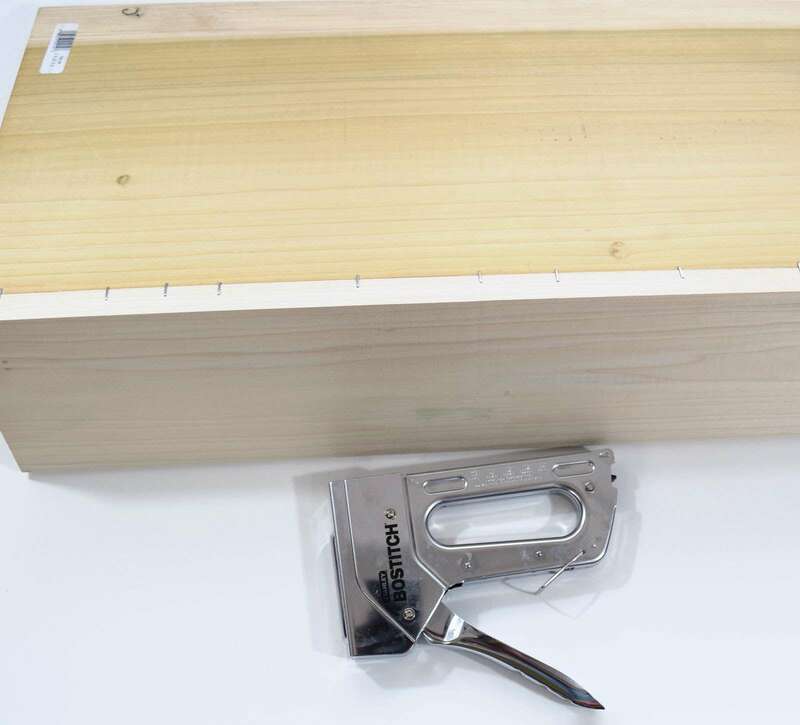 To reinforce where your two boards are connected to make the shelf shape tack down the seam on the back side with a heavy duty staple gun. Using your hand saw cut various lengths of paint stirrers. Be sure to cut the indentation area of the handle away leaving only straight pieces of wood. 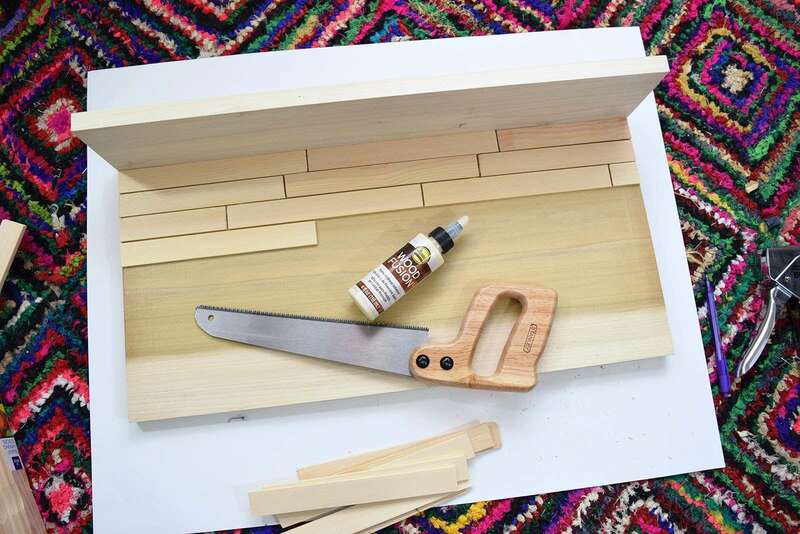 Attach the wood to your backing board, laying out in a pleasing pattern and cutting to length as needed, with a healthy squeeze of Wood Fusion to the backside of each piece. Once covered allow the glue to dry at least 4 hours. Turning your shelf upside down glue your 3/4" x 2" x 2 piece onto the bottom of the shelf. This is going to create a lip that we will be attaching our coat hooks to later on down the line. You might need to hang the piece on the edge of a table, play with the piece until you find a good way to make that bottom shelf nice and flat. Allow the glue to dry, overnight is best. 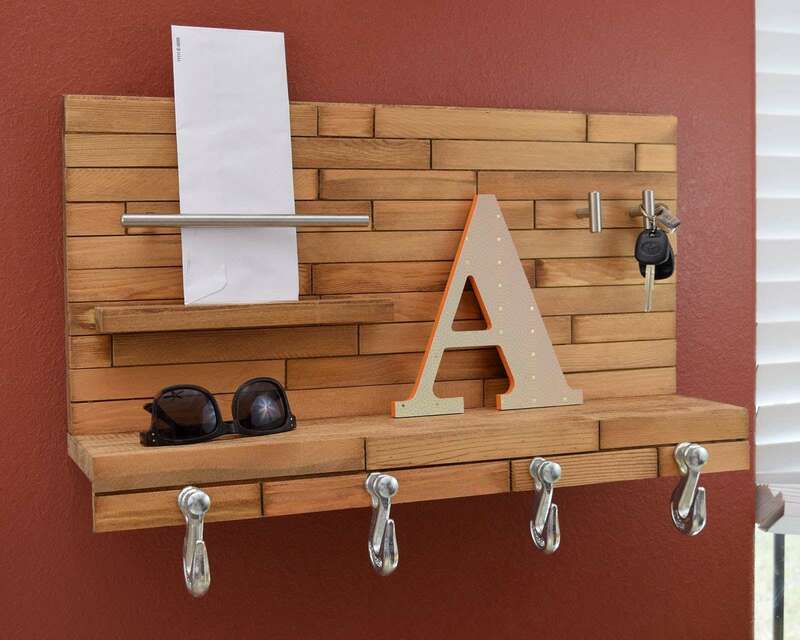 The mail holding area is created using a small piece of wood, to act as a shelf, and a bar shaped drawer pull to keep the mail together on that shelf. Place your drawer pull on the upper left portion of the organizer and then glue your 3/4" x 2" x 10.25" board 2-4 inches below where you'd like to place the bar. Allow the glue to dry at least 2 hours. Once dry, pre-drill holes through the back into the small shelf. 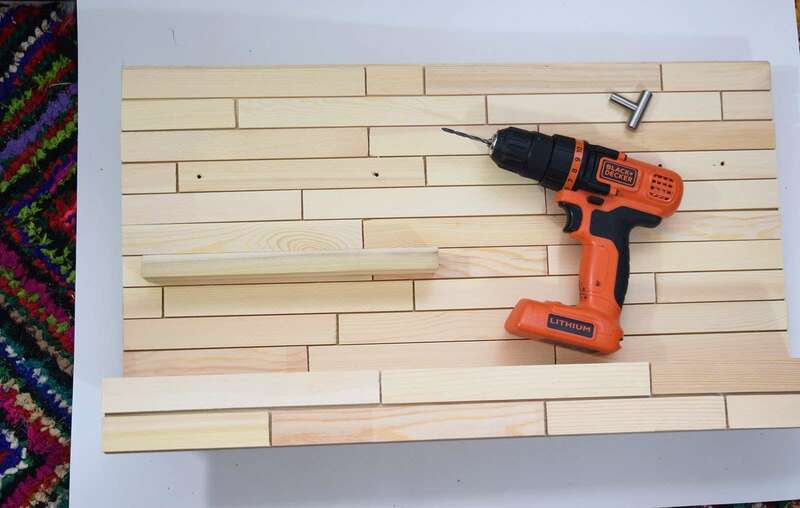 Secure the wood in place with #6 screws through the holes you just made. 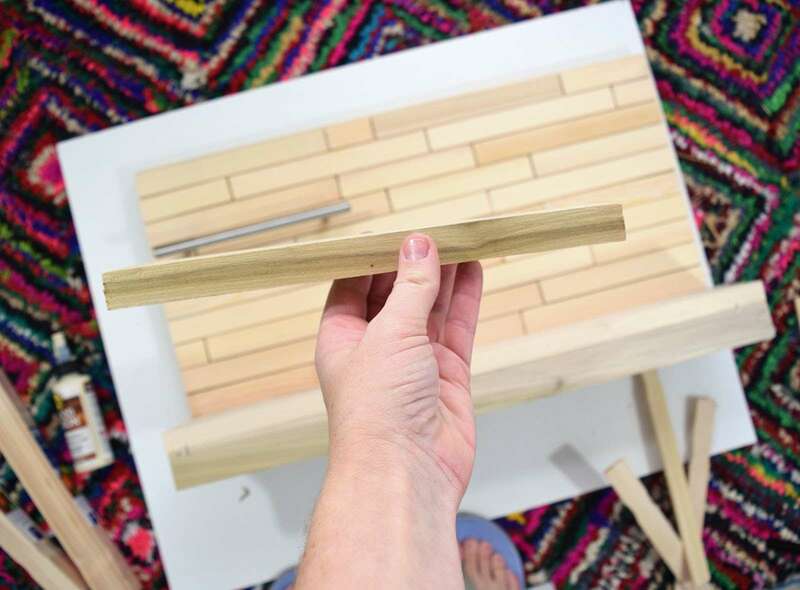 Cut paint sticks to length and cover the front lip that overhangs on the front of the organizer, using Aleene's Wood Fusion to attach. Allow the glue to dry, overnight is best. Drill through the back side and then attach your drawer pull above the shelf. On the right side of the unit pre-drill pilot holes and attach your knobs to act as keychain holders. Use a 1/2" bit to drill holes down the lip for each of your coat hooks. 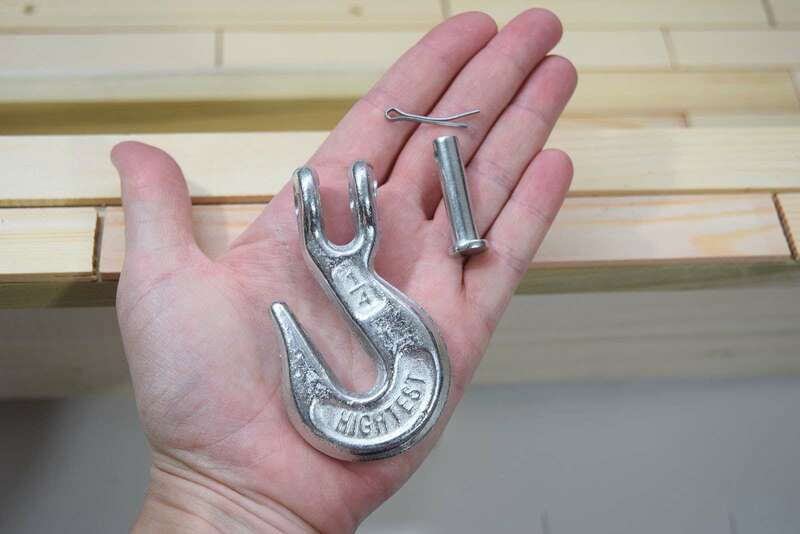 These are clevis grab hooks and they are going to add a fun, industrial bit of style to our organizer. You can find these near chain in the hardware store. Remove the pin by pulling the piece that looks like a bobby pin out. Run your 2" long bolts through each hook and in through the hole you drilled. Run your nut onto the bolt to secure the hook onto the lip. 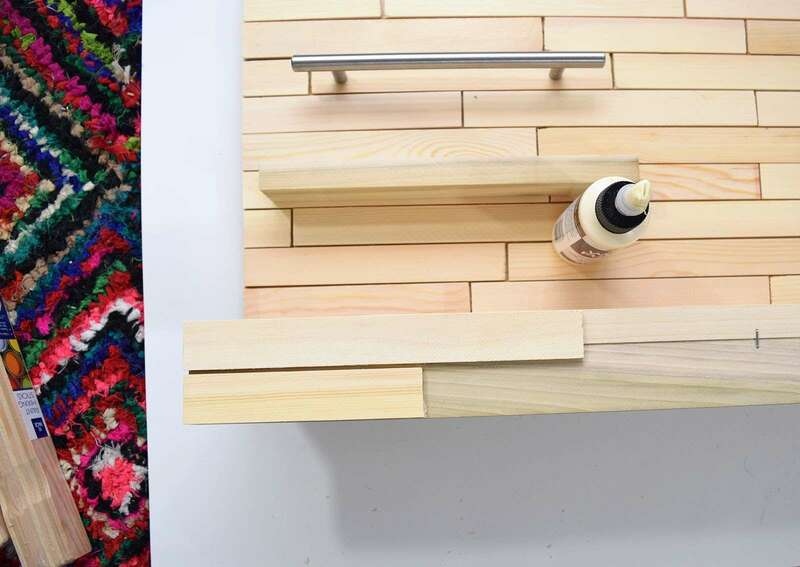 Remove all hardware and stain to your satisfaction. I used Puritan Pine, a new favorite! Allow to fully dry and seal with polyurethane, if you wish. Re-attach your hooks, knobs and pulls and add sawtooth hangers to the back to finish this guy up. 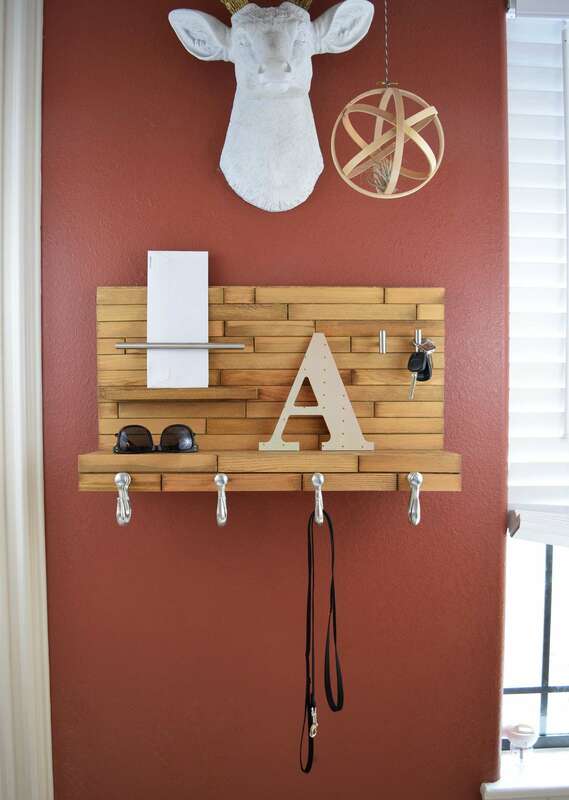 To properly hang this piece use screws into the studs or use the appropriate anchors that can handle the weight of the piece plus everything you plan to add to it under normal use. There is plenty of room for several pairs of sunglasses, a handful of mail and quite a few jackets or leashes!